The Place d’Armes invites you to experience the spirit of the French Quarter just steps away from Jackson Square! Book now your stay for an unmistakably New Orleans experience. The Prince Conti Hotel invites you to take advantage of exclusive fall savings on our room rates! 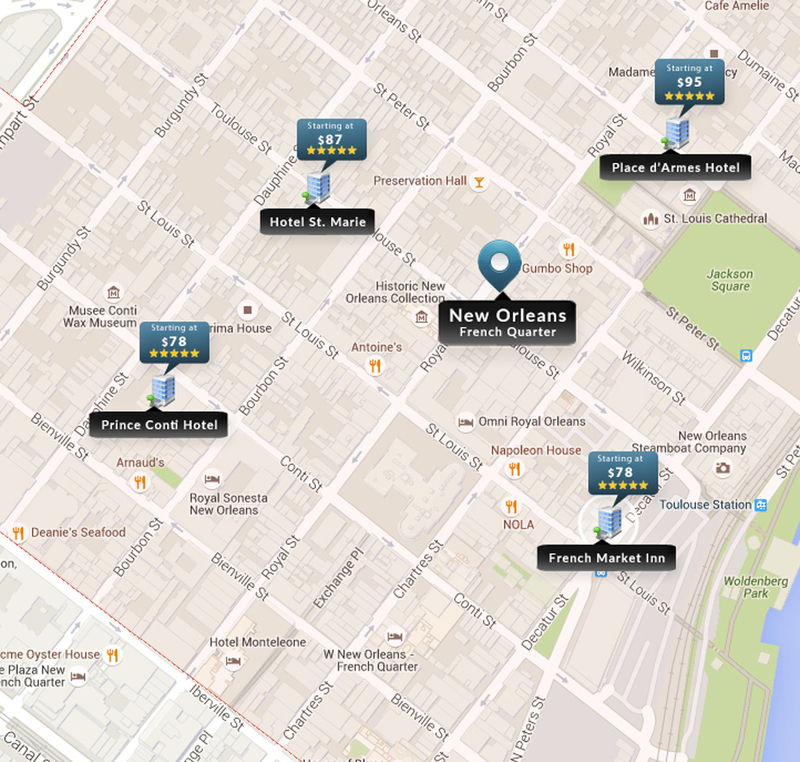 Book today and experience the true New Orleans spirit with this French Quarter hotel. The French Market Inn welcomes you to experience our unique historic property with modern amenities, like our new PJ’s Coffeeshop! Book today for an authentic French Quarter Stay. The Hotel St. Marie invites you to explore the Vieux Carre with a stay at our French Quarter property. Explore our exclusive savings and book today to experience the spirit of New Orleans. The Lafayette Hotel welcomes you to New Orleans’ beautiful Warehouse Arts District! A quick walk to the French Quarter, our property is ideal for exploring all of downtown New Orleans. We invite you to take a trip down south and experience the spirit of the Crescent City. Book your New Orleans hotel reservation today for a Big Easy getaway and discover what makes our city unmistakably unique. Whether you are looking for a luxury or an economy New Orleans hotel to plan a stay for business, pleasure, or a little bit of both, we are here to help you select the perfect hotel for your visit. We will ensure that your stay in our city not only meets your needs, but also has that “lagniappe” (a little something extra) to exceed your expectations. From historic classic hotels to more modern and trendy accommodations, we offer a complete listing of locally loved New Orleans properties spanning neighborhoods like the French Quarter, Garden District, Uptown, and more. When you reserve your hotel with us, you get the added bonus of authentic, native knowledge of the Big Easy’s hotspots and festive traditions. From the Marigny to Metairie, the Big Easy remains one of the most celebrated, interesting, and exciting travel destinations. A New Orleans trip means dining at world-famous restaurants, sipping the most unique cocktails around, celebrating fabulous entertainment, and experiencing the rich history, embedded tradition, and imaginative folklore our city prides itself on. A French Quarter getaway is just the beginning of what New Orleans has to offer. Let the good times roll! Web Design & Marketing |Click Here Publishing, LLC.